Françoise BARRÉ-­‐SINOUSSI, PhD, has been involved in retrovirology research, since the early 1970's and recognized for her contributions to HIV/AIDS research, in particular the discovery of HIV in 1983. Until 2015, as Research Director at the National Institute for Health and Medical Research (INSERM) and Professor at the Institut Pasteur in France, she has been leading research programs on HIV/AIDS pathogenesis, in particular on mechanisms required to control HIV/SIV infection and/or harmful T cell activation induced in response to HIV/SIV infection. Along with her research activities, Françoise BARRÉ-­‐SINOUSSI has been strongly implicated in promoting multidisciplinary and translational science. In 2010, she launched the IAS “Toward an HIV Cure” initiative, as part of her strong implication in advocacy to accelerate scientific evidences-­‐based public health interventions on HIV/AIDS prevention, care and treatment. She has a long lasting experience of collaboration with resource limited settings through the Institut Pasteur International Network and the coordination of ANRS research programs in Cambodia and Vietnam, according to her commitment in building capacity, training and technology transfers in Africa and in South-­‐East Asia. Today, she serves as Honorary President of the Institut Pasteur International Network and of the Virology Department of the Institut Pasteur in Paris. 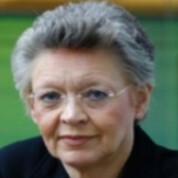 Françoise BARRÉ-­‐SINOUSSI is author and co-­‐author of more than 300 original publications and of more than 125 review articles. She has been invited as a speaker at more than 400 International meetings and/or conferences. She has been the President of the International AIDS Society (IAS) between 2012 and 2014 and is still member or chair of number of international scientific advisory panels and boards. Since 2009, she is a member of the National Academy of Science in France. She was recently elevated to the rank of Grand Cross of the French Legion of Honor.